In the past year, overall levels of violence in the Central African Republic (CAR) have decreased, and the UN mission (MINUSCA) has helped stabilize key areas through comprehensive, multidimensional efforts at the local level. Nevertheless, violence against civilians continues, attacks on humanitarian workers have increased, and national security forces lack the capacity to maintain security. Moreover, the various ongoing dialogue processes are uncoordinated and do not address critical questions. 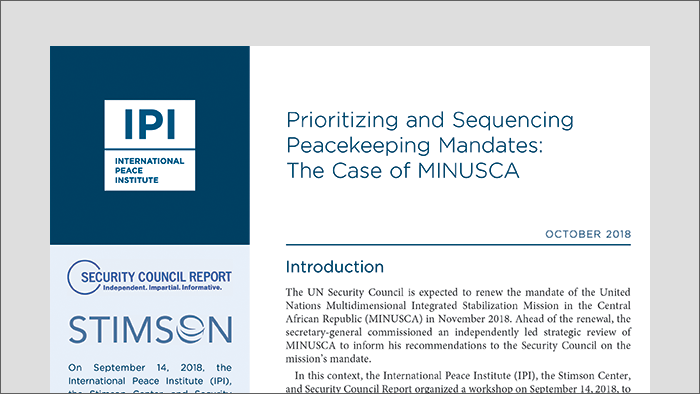 In this context, the International Peace Institute (IPI), the Stimson Center, and Security Council Report organized a workshop on September 14, 2018, to discuss MINUSCA’s mandate and political strategy. This workshop offered a platform for member states and UN actors to develop a shared understanding and common strategic assessment of the situation in CAR. The discussion was intended to help the Security Council make informed decisions with respect to the strategic orientation, prioritization, and sequencing of the mission’s mandate ahead of its renewal in November 2018. Participants considered MINUSCA to be among the most adaptive to demanding conditions and operational constraints. But despite these achievements, MINUSCA faces serious challenges to consolidating its gains and advancing a sustainable political process. Participants recommended that the Security Council adapt MINUSCA’s mandate to give the mission a stronger political role, broaden collective support for CAR’s security forces, and support processes that promote an inclusive national identity and representative state institutions.